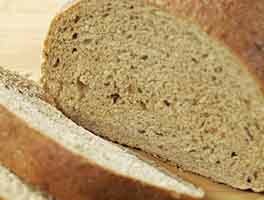 Whole-grain goodness doesn't have to come in a dense, dry loaf; this one is soft and moist, perfect for sandwiches. Combine all of the ingredients, and mix and knead them together — by hand, mixer or bread machine — until you've made a soft, smooth dough. The dough should be just a bit sticky; add additional all-purpose flour or water if needed. Allow the dough to rise, covered, for 1 1/2 to 2 hours; it'll become puffy, though it may not double in bulk. Lightly grease the base of a long covered baker or a covered bread loaf baker and sprinkle it with cornmeal or semolina. Gently deflate the dough, and shape it into a log. Place it in the pan and allow to rise, covered, for about an hour, until it crests about 1" over the rim of the pan. Before placing the bread in the oven, make 3 diagonal slashes across the top. Place the lid on the pan and place the pan into a cold oven. Set the oven to 400°F and bake for 35 minutes. Remove the lid and bake until the bread is golden brown, another 5 to 10 minutes. The bread will register 190°F on an instant-read thermometer inserted into the center. If you don't have a long covered baker, shape the dough into an oval loaf, and place it on a lightly greased or parchment-lined baking sheet. Follow directions above, baking for 35 to 40 minutes. For a classic crusty boule: Shape the dough into a round, and place it in a lightly greased, cornmeal-sprinkled cloche bread baker. Follow the directions as written, baking for 35 minutes covered, and 10 to 15 minutes uncovered. Yield: 1 boule. Made this yesterday in my bread machine on the dough cycle, and did not plan errands very well as the bread sat in the machine for another hour of rising! In spite of that oops I put it my long baker and covered to let it rise again and it did, very nicely just sitting on the counter top in my kitchen. Was very careful about slashing as I was worried about the extra rise time, but all went well. Baked according to directions with the covered baker and it came out great (actually looks like picture when sliced), and it's delicious tasting. Much as I want to LOVE this bread, I cannot get it to turn out anything like the pictures. I have all of the specialty ingredients AND the ceramic baker. The first rise goes OK, getting a decent amount of puffiness, but after shaping and placing in the baker, I let it raise over two hrs in my garage (very hot humid day). It still looks like a dense overgrown baked potato...I gave up and put it in the oven. It smells heavenly, but I know it is going to turn out very heavy and dense just as the first two tries. I could have added more water when it was on the dough hooks, but all of the dry ingredients were fully incorporated and the dough was quite moist. Please tell me what I can do to this to make it likable! I love this recipe -- I've made it 3x with some tweaks, because I don't have a covered baker or some of the special KAF-brand grain assortments. 1. I soaked my handmade substitute for the Harvest Grains blend (1/4c Bob's Red Mill 7-grain cereal, 1/4c rye + oat flake cereal, 1T flaxseeds, 1T poppy seeds, 2& sunflower seeds) in 3/4c water for about 30 min, then added the soaked seeds + their water to the dough, and reducing the amount of water to 3/4c. 2. 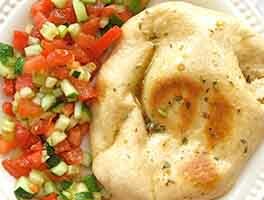 I subbed 1 tsp vital wheat gluten for the full amount of KAF Bread Improver. 3. I brushed my risen loaf with milk and topped with thick-cut oats and black + white sesame seeds, before slashing and baking. 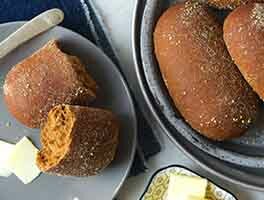 Love this bread but I grind down the Harvest Grains Blend a little more - a little too rough for me. The first time I made this recipe I didn't have a covered baker so I clamped one bread pan on top of the other with binder clips and it work fairly well. Then I purchased the Golden Grains Bread Bundle with the Covered Bread Loaf Baker. The covered loaf baker does make a difference with the vent holes. It came out great in the covered baker. Just need to make sure you make deep slits 1/2 to 3/4 inches. The bread makes excellent toast too. After viewing the picture of baked bread inside the Emile Henry long baker, which I used to make this recipe, I can see that breads don't rise over the bottom half. This has been my experience with other recipes in this baker. I should've left well enough alone and scored the bread and baked, despite its seemingly low rise. Instead, I put the dough in an oven with boiled water on the bottom to get it to rise higher. It rose higher but deflated when I scored it. It still tasted delicious once baked. Perhaps a note to let bakers know the breads will be longer rather than sky high in this baker. Everything I've made in it has been delicious. 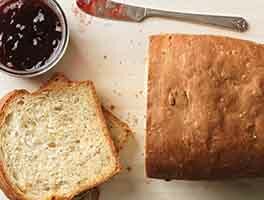 I couldn't wait to bake this bread and did so after the special ingredients arrived and I'd read the reviews. A nor'easter was making my kitchen a little cool and dry for proofing. The bread didn't rise as much as I'd like, despite proofing it covered in my microwave. I boiled 3 cups of water and put that in the bottom of my oven with the covered bread on the middle rack. It rose nicely but deflated when I scored the dough. I covered it and put it back in the oven, hoping it might rise a little. It baked up deflated but delicious with a not-too-dense, hearty texture and nutty flavor. I would love to know what I did wrong. If it tastes this good after a failed attempt, I can only imagine how wonderful it will be when I have success! I purchased the Golden Grains Bread Bundle. I have only made this once so far. It tastes amazing. My only problem was that I had a terrible time removing the lid, quite a bit of bread stuck to the lid. I am wondering if I should have made deeper slits in the dough when I put it in to bake? 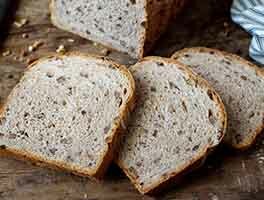 If you like hearty whole grain breads try this one. I topped my loaf with black and white sesame seeds. This is a wonderful bread. I made a double batch and discovered loaf pans were not recommended, so got out my couche cloth used for French Bread to help keep the "free form" loaves from spreading out too much. It worked quite well -- and heavy coffee cups on the ends of the loaves kept them from spreading vertically during the final rise, as well. My question is, how can I alter the flavor a bit to make them less "wheaty" tasting and more nutty whole grain? 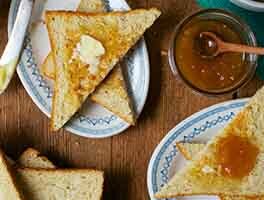 Should I try substituting a bit of orange juice as in the Classic Whole Wheat recipe, apple sauce, honey, toast the Great Grains first? Any suggestions? Thanks.